Wow. Seriously, just WOW. This cookbook is my favorite new cookbook for the year. It's released by Vertical Inc., so as you can guess, it's a carefully edited English edition of a Japanese book. So this is the real thing. The bentos aren't cute, this isn't a how to make cartoon characters out of carrots, nori and rice cookbook. There isn't a hot dog octopus in the whole thing. The focus is attractive and delicious food that can be prepared ahead to pack into a lunch box and the recipes are just as appropriate for adults as for children. These are the lunches you pack to make your co-workers jealous, and to give you a good reason not to skip lunch. So starting at the beginning, there is a very good overview of how to safely pack lunches so you don't risk giving yourself a case of food poisoning. 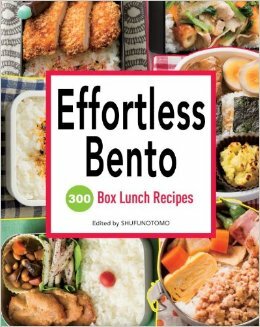 It talks about the different kinds of bento boxes, how to keep things cool, and how to pack the lunches so everything is at the optimum temperature. Then the recipes. 300 of them! Now, I know that some recipes aren't going to appeal to everyone. For example, my husband won't eat squid. My son will. My daughter is hit and miss with nori, and my son eats it toasted instead of chips. Well, actually I think every single recipe in this book is something my son would eat. He loves Japanese food. This cookbook has a lot of tasty options for Americanized tastes. You cook a certain number of servings ahead of time, and freeze or refrigerate them so packing lunch is fast. Some of the ingredients can be tricky to find if you don't live in an area with great markets but a lot of the recipes are a lot more accessible. So you might not be able to find fishcake and lotus root- but pork cutlets and panko crumbs are easy to find. Some recipes you can make substitutes. Like if you can't find kabocha in your area, substitute butternut squash. The cooking methods are easy to learn. The truth is, as much as I'm loving the recipes, the book is worth it for the tips, hints, and quick recipes sections which include furikake (rice seasoning), pickles, vegetables, instant soups and a nice collection of onigiri (rice balls) recipes. I'm loving this cookbook, and happily recommend it. Like Vertical Inc on Facebook to find out more about the cookbooks, craft books and manga they publish!